Groove to free concerts at Crab Cove in Alameda. 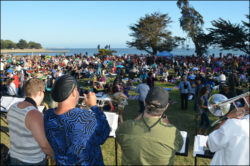 Concerts at the Cove features live music, food, extended hours at the Crab Cove Visitor Center, family activities, and beautiful views of the San Francisco Bay. Free Starlight Movies in the Park will again take place this summer for families to enjoy on select nights. Snacks and food are available and proceeds support the Teen Program. Bring a blanket or lawn chair. Please, no alcoholic beverages. July 13th -Wall of Blues – Best of the blues with a distinctive Blues Brothers vibe. It will be blues and brews in July when Wall of Blues meets Faction Brewing and Drake’s Brewing Company. August 10th -East Bay Mudd – Local dance band with classic soul and R&B music. In addition to great music, local restaurants offer soft tacos, hot dogs, kettle corn, and other taste treats for sale, and the Alameda Rotary Club sells beverages. Stop by the designated beverage area and enjoy a glass of wine from R & B Cellars, Rosenblum Cellars, and Rock Wall Wine Company. Enjoy freshly prepared street tacos from Calafia Taqueria and a variety of sausages from Café Jolie. Beer and wine available for sale (proceeds benefit the Alameda Rotary scholarship fund). There is also plenty things to do for the little ones with face painting and the Park District’s mobile visitor center in addition to the great nature exhibits at the Crab Cove Visitor Center. Concert goers are encouraged to bike to Crab Cove where the Alameda Rotary Interact Club will provide free, safe, and secure valet bike parking.